A birdhouse made out of a birch tree. What could provide more natural housing for the lazy bird who won't peck up it's own house than a man-made substitute of birch. City-people could confuse both birds and neighbors by having one of these outside their window. Imagine having *real* early-birds as tenants. Most New Yorkers will never own their own home but they can own their own bird house. Your not bonified until you own property so what are you waiting for? No brokers, no mortgage! 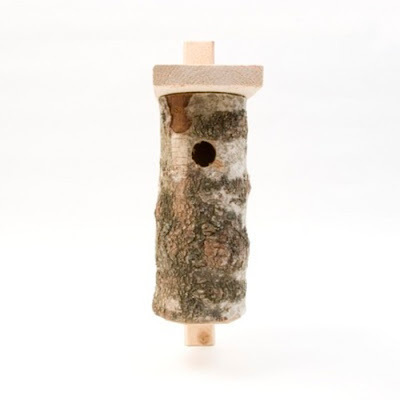 Every bird house is made from a unique birch.